What exactly, is the Word of God? | The Old Adam Lives! The Bible is the Word of God. All we know of Jesus we know from the writings of the Bible, from Genesis to Revelation. From it we know the word God spoke to create. From it we know the Word expressed through the prophets. From it we know of The Word, Jesus. From it we know of the world transformed. Just curious, though; St. Paul didn’t have a Bible, nor the other Christians for almost 400 years after Christ’s death and resurrection. But yet faith in Christ spread. 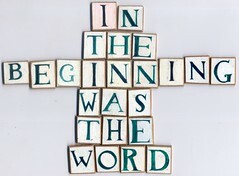 And the Bible tells us that in the begining was the Word. Does that mean that the Bible was the begining? 2 Peter 3:14-18 seem to indicate that St. Peter had a New Testament, or at least part of it. 1 Cor. 15: 3-11 seem to indicate that Paul had access to traditions of the Apostles that could well be the precursors to, or even the books of teh New Testament themselves. The Word is Jesus. The Word of God referes to the Scriptures. Maybe, come to think of it, we should use the words the Bible uses: Scripture and Word. I think what the Apostles and the early Church had was the power of the Holy Spirit that was in the gospel itself. And St. Paul, while he did have access to scriptures, had a personal knowledge of the Lord and the gospel. I think if you or I would find ourselves suddenly without a Bible in the midst of folks who did not know Jesus, we could announce to them the forgiveness of their sins, into their lostness, and that God could certainly use that Word. Jesus is definitely the Word. But by default in some sense what’s written about him and therefore the Bible are also the Word, since it doesn’t make sense to solely say Jesus is the Word, because all we know about him comes from those other things. Yet strangely for me Jesus takes the highest seat among all three. How about preaching and teaching?